Incredibly Easy to Fly, for Beginner. 4-channel and 2.4GHz High performance Quadcopter,operating without any delay, single drone with single frequency,multiplayers is available. The drone carries an 2MP camera and a 2GB micro SD card. It shoots full HD video at 720p and take 2MP still photos, achieves a whole new perspective looking down from sky! The quadcopter can be easily transformed to 4 kinds of model, so that you can get the most out of your copter indoor or outdoor. Flying with protection, running with 4 small wheels on ground, climbing with 2 big wheels on wall. 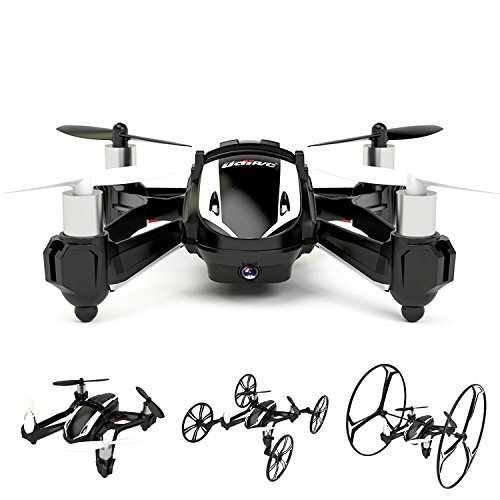 4-in-1 Design (Fly, Run & Climb) RC Quadcopter, you can get the most out of your copter indoor or outdoor. Flying with protection, running with 4 small wheels on ground, climbing with 2 big wheels on wall. Equipped with 2MP (720P) HD camera to take aerial photos and videos while flying! Bring a new perspective to your photos and videos from the air. With removable Micro-SD (TF) card stores enough for several flights. Equipped with 6-axis Gyro, Integrated design guarantee the precise positioning of the drone. One key 360° roll, continuous roll for perfect action and wonderful performance. With cool flashing LED light, can fly at night like a star. View More In Grown-Up Toys. If you have any questions about this product by Cheerwing, contact us by completing and submitting the form below. If you are looking for a specif part number, please include it with your message.